Early on, I had a very hard time with world building, as there were countless decisions to make at once. But things got much better later on after I got an awesome writer on board and we chose to follow a top down approach. We decided how the game should play, and how the world should work, and inferred the rules of magic from there. But we still need the world internally consistent, so some gameplay concessions are needed to make it work. In order to keep most of the feudal structure intact, and to preserve the feeling of technological advancement of X-COM, we decided early on to start from a mundane medieval world in which magic was awakening. But the fantasy convention for acquiring magic knowledge is to study some millennium old book, not to reverse engineer demonic weapons in a lab, so we needed a reason for these books to be there in the first place. We also wanted to have ancient dungeons filled with artifacts and traps, which would not work well if magic was a new thing. These reasons made us decide to go with the cliched solution of having magic return, with books, scrolls and artifacts hidden around the world. But we also needed to explain why dungeons would not have been looted while their magical guardians were inactive. I found the solution when one of my friends told me about the stronghold he designed as a high level D&D player: he built an underground dungeon and had all access points to it collapsed after he built a teleporter. The teleporter only access would allow these ancient dungeons to remain intact during the non magic age, unless would be looters would be willing to do an awful lot of digging (which is obviously much easier with active golems than when they lay dormant). This also gives another purpose to the study of old scrolls and tomes: these could help pinpoint the magic coordinates of the teleporters (or whatever is needed to unlock access to them). We also needed competing forces that would fight over magic artifacts, and neutral guardians to guard the ancient dungeons and their treasures. Another (budget) constrain was to have as many humanoids as possible, so that the paper dolling system could be reused. That is how our guardians ended up being gargoyles, skeletons and smaller golems. The main antagonist factions would be human, and roaming demons would act as a primal force attacking every faction. In order to have the player play catch up with the bad guys, we had to give them a head start, so we ended up with old mages hibernating during times of dormant magic, and reawakening as soon as it has become strong enough. 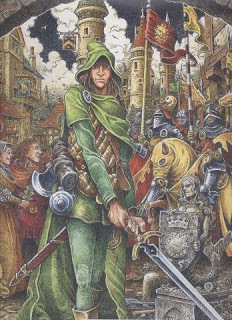 I have always found cheesy that a "high level" warrior could destroy a whole company of footsoldiers with his sword in most fantasy role playing games. This kind of power makes more sense if the division between heroes and normal characters is the result of supernatural forces, and not training alone. I suppose this is also why ancient mythological heroes almost always descended from the gods. It also ties into the theme better, because if characters can turn into one man armies by themselves, it makes learning and controlling magic much less potent. 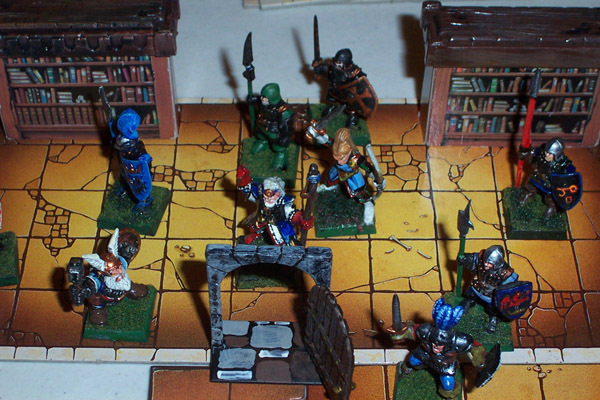 Our parties will be composed of a few heroes backed up by regular expendable characters, like these three heroes from Heroquest and their disposable soldiers. However, making supernatural abilities hereditary like in the sagas of old would not work in the game, as it would give us little control over the number of heroes, and losing one would be a tremendous setback, as having a new hero join in for convenience whenever one dies would be a little lame. The better way around it would be to have artifacts or places of power that would be attuned to a character, granting him supernatural abilities as the bond between them grows stronger. This makes balancing much easier as another character can ascend to become a hero after his predecessor meets his end. Out of these two, places of power tie with the Zodiac theme better (it could be landmarks shaped like the relevant constellations, or places that resonate with these constellations), and unlike artifacts, would not be lost if the bound hero was to be slain and left behind during a quest. However, they could also be taken by the opponent, which could make securing them too important in the campaign, so a middle ground solution would be to have "large" artifacts to deliver to the stronghold. Mages are only a subclass of these "superpowered" characters. In a way, the champions of the Zodiac Order would be close to the Jedi (which offer a lot of sub specialization according to the more recent Star Wars RPG), or the Kai monks of the Lone Wolf series of game books. Fantasy equivalent of a Jedi from Lone Wolf that (hopefully) won't get us sued. We end up with a dual pool of characters: regular characters waiting for their chance to "ascend", and ascended heroes that are in limited number. These ascended heroes will keep learning ordinary abilities on top of their supernatural ones. This dual experience system is close to the way Psionics worked in XCOM: Enemy Unknown. Logistics and transportation determine how fast armies can move and how large an area a ruler can control. For this reason, we needed to establish how teleportation would work early on. We needed teleportation to exist to allow quickly dispatching your heroes to a mission location, and justify endless reinforcements for the defender during missions. But as the latest seasons of Game of Thrones have shown us, teleporting armies would make it difficult to plan any sort of strategy. We needed to be able to teleport champions to their mission area without travelling for weeks, as it would make little sense for some missions to remain available for so long. So the stronghold would allow teleportation to the mission location. Walking back to the stronghold works as a mechanism to enforce crew rotation, and makes it useful to have several secondary bases to teleport our warriors back to the main stronghold. Teleportation needs to work from a fixed teleporting infrastructure (the Stronghold teleportation chamber) to a chosen destination. A spell of "clear teleportation landing zone" and another of "lock teleporter" were obviously cast before to avoid any collision related harm to our champion. We also need to find a way to restrict the possible destinations. By requiring a physical transportable "beacon", carried by a spy, or another known teleporter, we can limit the teleportation destinations to a reasonable number. In order to avoid army teleportation, we also need to limit the "energy" a teleporter can use, so that only a few characters can use it, otherwise, we'd be back at teleporting armies. Have a successor take the mantle. The first solution would go against the theme of a desperate war in which many warriors have to sacrifice their lives to stop the enemy. We definitely wanted a body count close to the earlier X-COMs. It would also lead to stupid gameplay effects, like sacrificing the commander every time it can avoid average Joe to bite the dust. The second solution would basically lead to either a lot of save scumming or the leader never taking part in any mission. The third solution works well when focusing on a kingdom or organization, and not on a single individual, which is exactly what we want, but we would have needed quite a large supply of heirs if the game was to have a high kill count. This would either lead to the main character breeding like a rabbit, or the player ending up with one of his many distant cousins. That was one of the reasons we switched from a kingdom to a knightly order: Knightly orders don't require a blood related successor. After the death of the commander, another knight of the order would simply be elected to step in and take up the mantle. 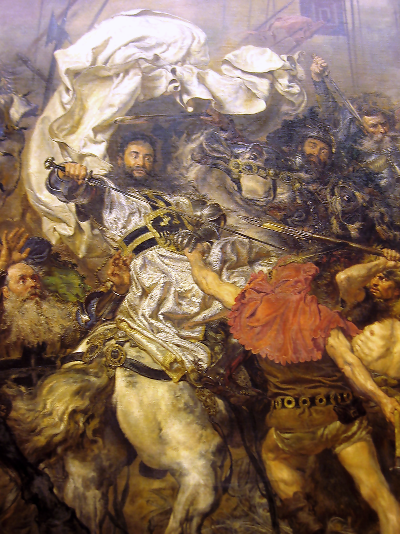 Ulrich Von Jungingen, Hochmeister of the Teutonic Knights, about to die at the battle of Grunwald in 1410. 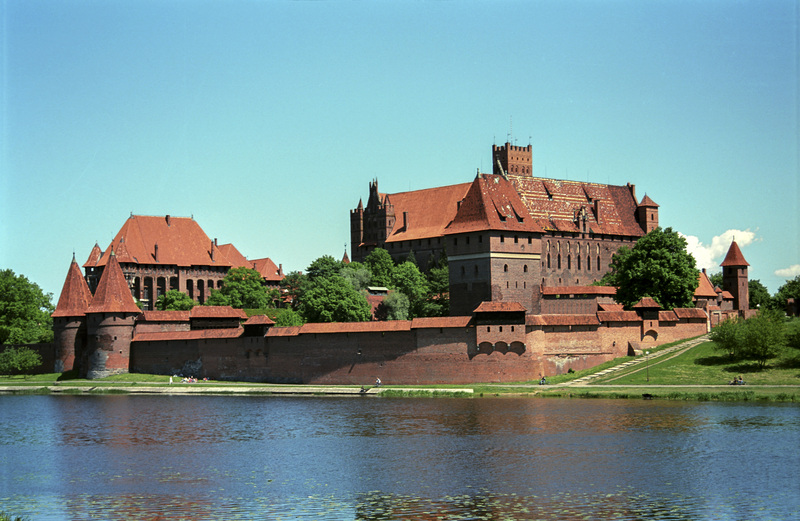 Granted, it more or less meant game over for the Teutonic Knights in Poland anyway, but it was because it occurred as part of a total party kill. This also ties well with the bond between places of power and characters: Becoming the commander allows the ascended character to access powers unique to the ring of command (or whatever artifact/location is tied to the leader). But we still need the Grandmaster of the Zodiac Order to have psychic powers as he should be able to command a mission without being physically present. He just can if he so wishes (and we just need to find proper balance to make sure it is a difficult decision every time). These changes allow us to make the story about the order itself, and not Gaius Laptopus, which also fits the theme better. Note that none of the elements described here are final. We reserve the right to change everything again for any arbitrary reason. We are far from done with magic in the world. We'll address the way magic influences warfare in the world of Zodiac Legion in a future update.